Delhi's ethnic groups are diverse. The Yamuna river's flood plains provide fertile alluvial soil suitable for agriculture but are prone to recurrent floods. The Yamuna, a sacred river in Hinduism, is the only major river flowing through Delhi. The original natives of Delhi are those whose ancestors lived in the Yamuna basin, a region which spreads radially from the capital up to a distance of approximately 200 kilometres. Today the migrant population consists largely of Punjabis, Bengalis and recently, Biharis. 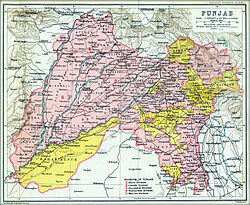 During parts of the British Raj, Delhi was made a district city of the Punjab Province of British India. This province was not ethnically homogeneous and large amounts of Hindi speakers resided in the southeast, now Haryana and Delhi. According to a 2013 The Hindu article, surveys by the political parties indicate that the dominant voter caste / community groups in Delhi include the Jats (10%), Punjabis (9%), Vaish (8%), Gujjars (12%) and Sikhs (4%). A 2013 The Pioneer report estimates Jats to be only (5.5%) of the electorate. According to another 2013 The Pioneer report, the Brahmins comprise 12-14% of Delhi's population. According to a 2015 India TV article, the major voter social groups include Punjabis (different castes and religions) (35%), Purvanchalis (24%), Muslims (12%), Jats (8%), Vaishyas (8%), Gujjars (8%), Sikhs (5%) and around 35 lakh Uttarakhandis. Jats, Punjabi Khatris and Brahmins dominated politics in Delhi for many decades. In the 2015 Legislative Assembly election, 12 out of Delhi's 70 constituencies were reserved for scheduled caste (Dalit) candidates because of dominant Dalit population. By 1991, the number of those born outside Delhi was 3.7 million (out of a total population of 9.4 million). Most of these included immigrants from Uttar Pradesh (1.75 million) and Rajasthan (0.23 million). However, these neighbouring states are themselves ethnically diverse, so it is hard to use this data for determining the ethnic make-up of Delhi. :19 There are also a large number of immigrants from the East Indian states of Bihar, Jharkhand, Orissa and Bengal. The number of South Indians is relatively less, with most of them coming from Kerala and Tamil Nadu. There are also several immigrants from the North-East India, who have migrated to Delhi because of the conflicts and bad economy in their native states. Today Hindi and Punjabi are still the most widely spoken languages in Delhi and have become the lingua franca. English is the principal written language of the city and the most commonly used language in government work and in Delhi's huge financial sector. In addition to Hindi, Punjabi and English, Urdu also has official language status in Delhi. ^ Memorandum submitted to the States Re-Organisation Commission Regarding Greater Delhi, 1 May 1954, quoted in Shiv Charan Gupta, Delhi: The City of Future, New Delhi: Vikas Publishing House, 1987, p146-156. ^ Percival Spear, Delhi: The Stop-Go Capital: A Summation, p32, in RE Frykenberg, (editor), Delhi Through the Ages: Selected Essays in Urban History, Culture and history. Delhi: Oxford University Press, 1993. ^ The American Heritage Dictionary of the English Language (fourth ed.). Houghton Mifflin Company. 2000. ^ Pioneer, The. "Delhi's Jats: From farmers to determined political climbers". The Pioneer. Retrieved 10 September 2018. ^ Pioneer, The. "Fight for Brahmin votes intensifies". The Pioneer. Retrieved 10 September 2018. ^ "534 Sanjay Kumar, A tale of three cities". www.india-seminar.com. Retrieved 21 March 2019. ^ a b c d e Sanjay Yadav (2008). The Invasion of Delhi. Worldwide Books. ISBN 978-81-88054-00-8. ^ Duncan McDuie-Ra (2012). Northeast Migrants in Delhi: Race, Refuge and Retail. Amsterdam University Press. pp. 161–. ISBN 978-90-8964-422-0.